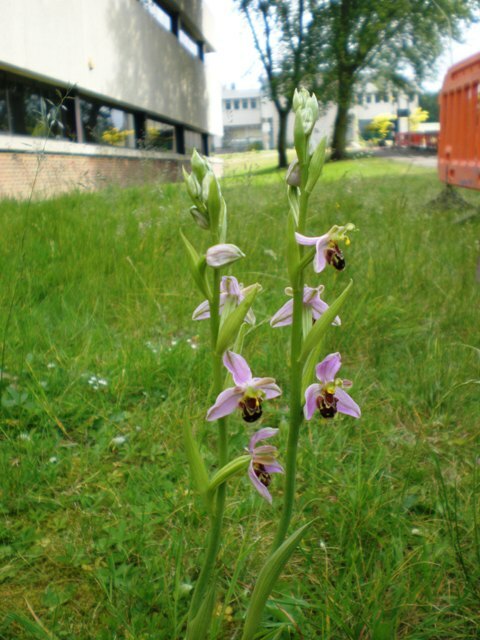 Recently rediscovered on campus, sprouting through building works, the fabulously exotic flowers of Ophrys apifera conjure up images of sun-bathing pink-winged bumblebees on a stalk. 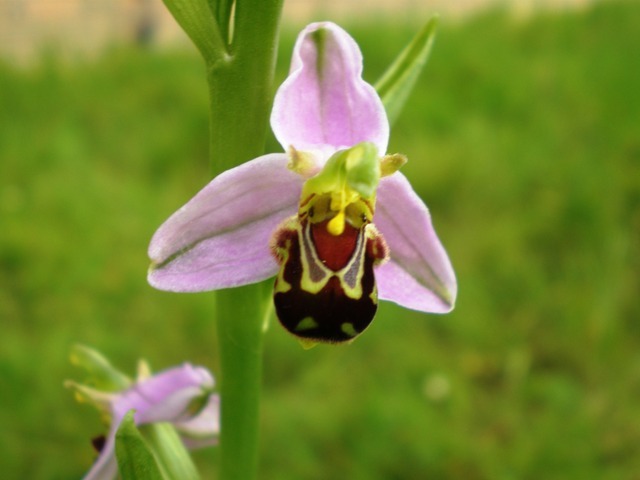 Also known as the bee orchid, it is a member of the family Orchidaceae. Appearing unexpectedly seems to be the norm for O. apifera, popping up from subterranean tubers; especially in exposed ground such as on spoil heaps, grassland, scrub and sand dunes. Like many Ophrys species the bee orchid aims to use mimicry to aid its pollination, flowers resemble their insect pollinators. Each of the small flowers have two inner sepals that look like antennae, the third sepal forms a lip, enticingly resembling the body of a female bee. The broad tip of the lip is velvety and the edges fringed with dense, dark hairs. This is surrounded by three large, pink, petal-like outer sepals. However, research has shown that in Britain and generally elsewhere, O. apifera, is self-pollinated and the pollinia, which hang on a thread, are blown against the receptive surface of the stigma. Keep an eye out for this fabulous native, in flower June to July. This entry was posted in Flowering Plants, Orchidaceae, Plants and tagged flowering plants, Orchidaceae. Bookmark the permalink.